If you are looking for information on the Snap-On Tools franchise business opportunity, SnapOn Tools franchises, Snap On Tools franchising or Snap-On franchise information, then you have come to the right place. Snap-on has the #1 market share position in the industry and our tools are universally recognized by professionals as the absolute highest quality tools in the industry. Snap-on franchisees are in the enviable position of selling exclusive, premium products to their customers. Snap-on has more than 19,000 products, operates in more than 130 countries and employs approximately 11,600 people worldwide. 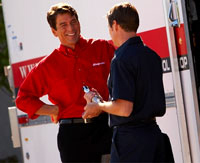 Snap-on also has a franchise network of more than 4,000 franchisees. Headquartered in Kenosha, Wisconsin, Snap-on is a leading global developer, manufacturer and marketer of tool and equipment solutions for professional tool users. Snap-on Incorporated is a $2.8 billion, S&P 500 company whose product lines include high-quality hand tools and tool storage solutions, diagnostic equipment, information and management systems, and "under-car" shop implements like hydraulic lifts and tire changers. Snap-on serves technicians in the auto, marine, and aviation industries, vehicle manufacturers, utilities, and government and industrial organizations. At Snap-on, we are driven by a relentless determination to be the best, providing the most practical, original and inventive solutions for the professionals we serve. A roll-up-your-sleeves mentality toward innovation transforms customer listening and the best new thinking into proven products and services. Our innovation and technology are important to the professionals who make their living using Snap-on products. Whether it's our hand tools that perform under the most rigorous conditions, diagnostic equipment that is easy to use, or tool storage solutions that utilize every square inch of workspace, innovation is a quality found throughout our product line. Basically, a franchise is an agreement between two parties that gives the franchisee the rights to market a product or service using the trade name of the franchisor. 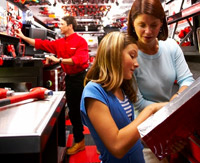 Snap-on grants franchisees a license to operate a franchised mobile store. These high-tech showrooms on wheels bring a complete retail-shopping environment to customers - right where they work. Our business model is based on a proven system that has made Snap-on the #1 tool brand for nearly 90 years. 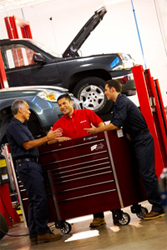 With Snap-on, you are in control of your franchise. You have a weekly service requirement to meet, but you set your schedule and you manage your customer relationships. But remember, you are not alone. You will receive continued support throughout the life of your franchise. And if you work within our proven system, you will have everything you need to help make your franchise a success. The Snap-on franchise proposition stacks up well against other franchise opportunities in numerous ways. Cost of entry is very competitive, products are best in class and the customer base is already established. Plus, there is no expensive investment in a fixed site location or ongoing percentage rent like you have in most lease agreements. Industry Leader: Snap-on is universally recognized by professionals as the absolute highest quality tools in the industry. Relatively Low Start-up Costs: As low as $16,688 for a Gateway Franchise. Snap-on Credit, LLC: Snap-on Credit has financing programs available that may meet your initial investment needs. Not Tied to Real Estate: The benefit of a mobile tool store is just that: it's mobile. No building codes to comply with and no fixed site expenses like percentage rent and leasehold improvements. History of Success: Snap-on has built a proven business model of success that has lasted decades longer than some of our competitors. Built-in Customer Base: Each franchisee receives a protected, surveyed list of calls of potential professional tool users. To get started on your road to Snap-on ownership, please contact us today!